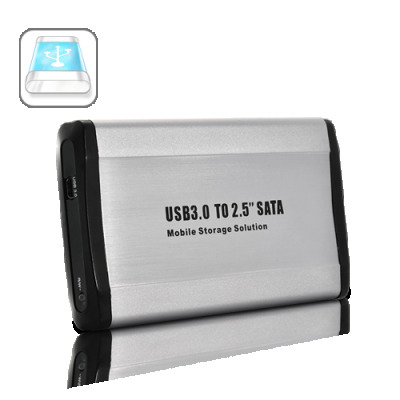 Successfully Added USB 3.0 to 2.5 Inch SATA HDD Enclosure to your Shopping Cart. This USB 3.0 SATA drive enclosure lets you connect any 2.5 inch SATA HDD to your computer through USB 3.0. Supporting data transfer rates of up to 5 Gbps, this external HDD enclosure delivers access to files at lightning fast speeds - 10x that of USB 2.0, and 60% faster than SATA II eSATA. In addition, the USB 3.0 interface is backward compatible with USB 2.0 and USB 1.1, so the enclosure can be used with older systems that don't support the newest USB standard, at speeds of 480Mbps or 12 Mbps (respectively). The drive enclosure features a compact, free-standing design that requires minimal desk space, and comes in an attractive brushed aluminum casing. This versatile external storage solution is compatible with a broad range of Windows operating systems, as well as Linux and Mac OS X and up. Don’t delay, order now at our factory-direct wholesale price and we’ll ship your package out within 24 hours. This product is backed by our full one year warranty. USB 3.0 up to 5Gbps! Makes a great gift for the digital media lover who needs more storage space. Helps you instantly add a hard drive to your system for expansion or backup purposes. Easily transfer hundreds of GB's of videos, music, documents in just a few minutes. When transferring your files using this USB 3.0 cable to the HDD enclosure, average speed using the 2.0 USB port on your PC will be around 50MB/s. Note: Current hard disks do not exceed the 3.0GB/s transfer rate, but the USB 3.0 cable can support up to 5GB/s. This way, the USB 3.0 Cable will allow maximum transfer rate of 3.0GB/s when using a USB 3.0 Port on your PC.